It’s rare that a band is recognized for their talent and given the chance to make it to the next level. Only a few get to slip through the tiny sliver of success playing bigger venues in front of thousands of screaming fans. 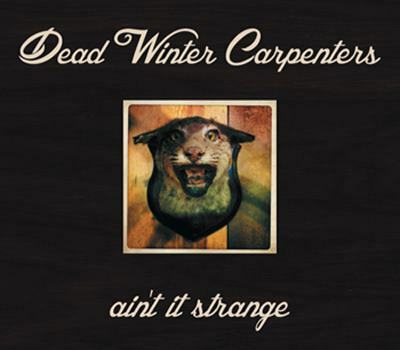 Dead Winter Carpenters from San Francisco and North Lake Tahoe has done just that – they have emerged from the breeding grounds of up and coming bands in the last year, opening up for big name acts and attracting a loyal fan base at every stop. Shows are high energy and usually take fans on a foot-stomping, barn-jamming, get-down with the hope that all in attendance leave soaked with pleasure and unaware of the hardships in their daily life. No two shows are ever the same with DWC and their ability to produce unique, original songs is worthy of some acclaim. Every night the band shreds their instruments with as much jam grass and honkytonk as they can muster. Playing fiddle for DWC is Jenni Charles who appears classically trained and a country girl at the core. She is fully aware of the jam formula when playing fiddle and able to ride the peaks and crescendo’s with ease. Charles is gracious, has amazing stage presence and she’s got a lovable quality that is comforting to watch. On guitar and vocals is Jesse Dunn who has a strong voice, can play his instrument like a pro and is humble when speaking off stage. Dunn has the ability to be a driving force in the jam community, just give him time to hone his craft, polish his persona and in no time, Dunn will be at the top of his game. Playing drums is Ryan Davis who has a big sound behind the kit and is always in the pocket. Davis can drive the music-train comfortably, play dynamically when needed or rock it out like “Animal” from Sesame Street. Also in the rhythm section is David Lockhart who is a master with the upright bass. Check out any of his solos online and you’ll see talent and pure chops as he navigates his way through songs and jams. On acoustic and electric, lead guitar and vocals is Sean Duerr who seems to have a country influence in his playing and able to take a solo at any moment. You wouldn’t know he was there a lot of the time, but when Duerr speaks up, listeners take notice. He’s got finesse and creativity in his playing and a nice compliment to this lineup. 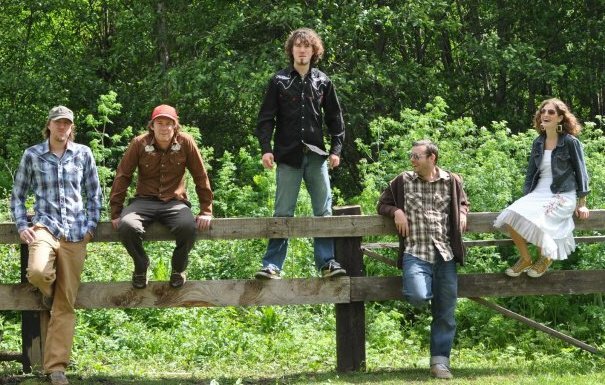 The bands sophomore album Ain’t It Strange was just released this past spring and is sure to delight its fans. The 10 song compilation is professionally done, well executed and drives hard from beginning to end. It would be impossible to remain seated while listening to Ain’t It Strange – the sound is too uplifting and spiritual to be motionless and passive with the high energy of every track. There should be another 10 songs on this album – Ain’t It Strange is too short to convey the scope and vast array of influences this band wants to get out to the world. DWC is passionate about their direction, eager to create amazing music and committed to the process of bringing people together like one big, musical family. It’s possible that DWC is filling the void that Blue Turtle Seduction left last year when they decided to disband and call it quits. Now, bay area fans and the Tahoe community can relish in the inspiration and bliss that DWC puts out. Concert halls are filling up fast at DWC performances, so see this band now before it’s too late. Pack your bags, hit the road, and find them at festivals and shows this summer. With over 50 gigs booked over the next few months, it would be hard not to recognize this “diamond in the rough”. DWC can only go up from here. JBF: Congratulations, you guys are playing a lot and you just released your second album. That has to feel good. JBF: Please take me back to the beginning and how this ensemble came together. Jenni: It was very serendipitous – some of us actually met through friends at a festival and had the same goals and ideas for what we wanted to do as a band. We put DWC together based on our friendship and abilities. We decided that in 2010 and then two months after that we recorded our first album. Touring started almost immediately, everyone was in agreement to go on the road. It’s always been a dream of mine as well as everyone else in the band to travel and tour. We love that life and feed off the energy that it brings us playing constantly. 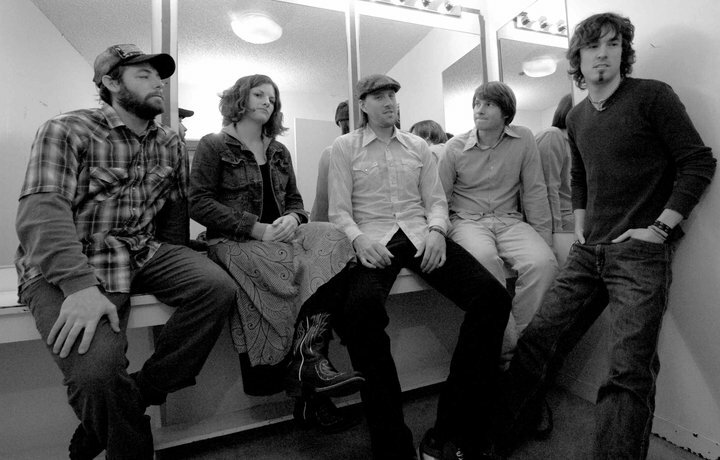 Jesse: At that point in time, three of us were playing in a San Francisco Bay area band called Montana Slim String Band, and then Jenny and Ryan were playing in The Rusty Strings as well as a group called Truckee Tribe, which is a reggae band. We were all playing, but not as frequently as everyone wanted. JBF: You have a very unique band name. Dave: Well, I like the name because it’s not only ambiguous, but it’s mixed as a bleak idea, with a positive spin at the same time with each of the three words. You can actually think of a few different things from the name. Jenni: The one that Dave always tells us is the Fibonacci sequence that it has – one syllable “Dead”, two syllables “Winter” and three syllables “Carpenters”. It’s so rhythmic. Jesse: My favorite thing about the name is that where we live in the winter time, carpentry is a big thing. There’s a ton of old cottages and ski houses that are always falling apart. There is definitely a camaraderie in Tahoe with carpenters which is my favorite part. We sell a lot of our merchandise to fans of the music, but more importantly to people who are carpenters or who know carpenters. JBF: It is great to see that Mystic Hot Springs is still hosting bands in Monroe Utah. I have played there a couple times and wonder what Mystic means to you and the band? Jenni: Mystic is magical, they have a really good thing going on there. They are wonderful people offering an oasis for any traveler to come and relax and are supportive of live music. They just started recording at shows and festivals with all their analog systems. They are doing everything “old school”. We love going there to hang out on tour and seeing all the other bands that have come through there as well. You can go inside and see all the posters and signatures of musicians. It’s definitely like coming home for us. JBF: With the new album and the change of the industry, I am curious why you decided to record a full length album and what your expectations are for the release? There is a paradigm shift happening with the nature of the business in terms of downloads and video. Jesse: My whole take on the whole thing is that I am still hopeful that musicians like us or at any level can still go out there and give it a go. It’s mostly about getting the music into people’s ears, and for a band like us in a grass roots nature, a full length album accomplishes that question. I know that it’s not the life that it used to be with tens of thousands of dollars advanced for an album. You just have to go out there and put your nose to the grindstone. Overall, it’s still a positive thing releasing an album, playing to people and feeding off the energy they bring. I don’t know if it can be as lucrative as it once was. But, there is still passion for music out there from listeners and from players. Personally, I am optimistic and having a great time. JBF: What does happiness and contentment mean for you in life and with the music? Jenni: For me, contentment is making other people happy. Jesse always says, “Forget your worries at the door”. The minute people step into our concert, fans are there to have a good time and forget about everything going on in their life. We may bring them on an emotional roller coaster, but hopefully they’ll leave feeling relieved, stress free and content. If someone can feel all those emotions and go away with being grounded with so much joy from an experience, that to me is happiness. Knowing I created that emotion is perfection. If we can all share in that happiness then we reached the level we are trying to get to. We found a way to collectively work together in order to reach that goal. I am happy around my band mates, we are friends and we’re a family. If we can make everyone else in the crowd become a family and become happy we are also creating a new community. That is the essence. Dave: The main thing for me is freedom of creativity and expression. As long as there is space for that, I love creating and making something. If people like it and it brings them joy, I am content. Jesse: As long as collectively creating something as a group and working towards artistic creation and expression then it will never get stale. JBF: You mentioned playing festivals and shows this summer, but what is the plan later in the year and through December? 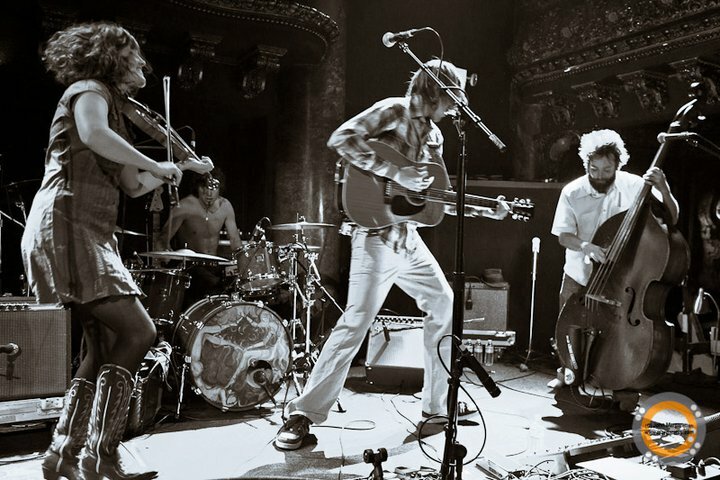 Jesse: For the past couple of years we have done a great job with our manager and booking agent trecking up and down the west coast, getting out to the mountain states. We have been recently discussing a game plan for starting to get into new regions. We’ve been around the country, but never really honed in on where we wanted to be for a couple weeks at a time. In September we are doing a run to the mid-west, Ohio, Indiana, Illinois, Kansas, getting down to Kansas and hopefully Tennessee. Then we’ll come back home and do some Halloween shows, take some time off and then head back out to the Northeast and swing back through Colorado. On the east coast, there are college towns and music spots one after the other. Out here places are so spread out having to drive for hours at a time. Both coasts are beautiful, but each has its own type of territory. During the winter we’ll play the southeast where its warmer which is awesome. Maybe we’ll swing through Dave’s part of the country in Texas and Louisiana. We’re planning on staying on the road with new albums every year or 18 months. The band could do an EP as well twice a year, who knows, it’s kind of up in the air at this point. JBF: I get it! Have a great year, see you at the High Sierra Music Festival in two months. Good luck!